[Religion News Service] Two hours before the sun set over the Pacific Ocean on Nov. 8, the Rev. 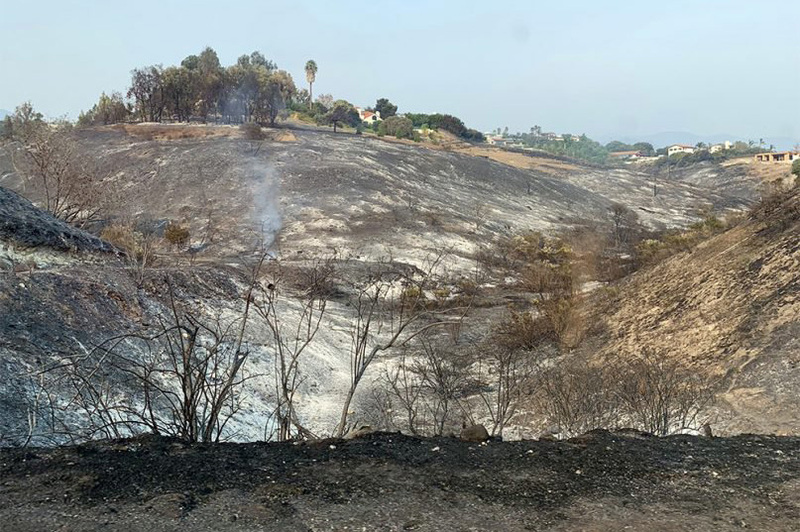 Joyce Stickney, rector of St. Aidan’s Episcopal Church in Malibu, received word about wildfires that had broken out 30 miles away in the hills above the Simi Valley. They took two cars — Stickney driving one, her 17-year-old daughter Grace driving the other — and headed north toward Oxnard, where the children’s babysitter lives, while thousands of their neighbors fled south toward Santa Monica. Stickney and five of their children (two are away at college) arrived at the babysitter’s mobile home where later that night they were joined by her husband, Paul, who had left for work on a TV show set at 4:30 a.m., before the smoke and chaos had descended. Wildfires are creating disaster areas across the state, with the Camp Fire in Northern California proving particularly deadly and destructive. Authorities report 79 fatalities and more than 12,00o homes destroyed in and around Paradise and Chico, as of Nov. 20, and the fire in that region has consumed more than 150,000 acres. Episcopalians there say they are gathering strength and resilience through community connections and an outpouring of love and concern from across the Episcopal Church. In Malibu, waiting for news was a test of Stickney’s faith and mettle, but when she it came, it was a relief. St. Aidan’s survived the fire unscathed — miraculously so, Stickney said, as flames stopped at the edge of the new driveway that had been completed just days before the wildfires. As part of a multi-year parish renovation, the driveway was replaced for the express purpose of making it easier for fire trucks to reach the church, which also houses a preschool attended by her two youngest children — twin 2½-year-old boys. St. Aidan’s congregation is emblematic of that diversity. While there are members who work in the entertainment industry — Milkovich was a TV and film producer for decades before he felt a call to the ministry and became ordained last year at age 63 — the parish is also home to several professors from Pepperdine University and retirees who worked for Hughes Aircraft and other local companies. The Woolsey fire has been more than 90 percent contained and evacuation orders had been lifted for most of Malibu by Monday, but not in time for their Nov. 18 Sunday service. Instead Stickney and about 10 other St. Aidan’s parishioners joined their mother church, St. Augustine in Santa Monica, for worship. Stickney expects her parish to be back to a regular service schedule in Malibu beginning Nov. 25. In the wake of the fires, Stickney largely is shepherding the St. Aidan’s diaspora electronically, by phone, text and email, as displaced members have fanned out along the West Coast seeking shelter. Seated in a booth in the back of a Panera Bread 50 miles from St. Aidan’s and her home by the sea, a weary yet determined Stickney, enlivened by the faith of her own flock, read aloud a short note from a new parishioner whose family had recently relocated to Malibu from Texas, only to have the family’s new home burn to the ground.